The Classic Trench Dog Coat by Dogo in Black is a fashionable approach to chilly weather. 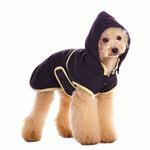 Protects dogs from wind and weather. touch fastener closures at waist. Stylish classic trench coat with beige trim. 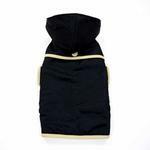 Water resistant, removable hood, warm fleece lining, and convenient leash hole located around collar. Made of 100% polyester. Machine wash in cold. 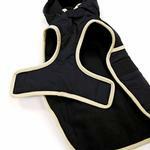 3XL and 4XL touch fastener closure is designed internally for a better fit and look. 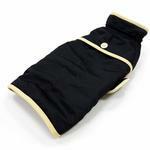 The cheery dog coat is lightweight and good for use in all weather. Classic Trench Dog Coat by Dogo - Black Customer Photos - Send us your photo! Parker is a very sweet and loving dog, but extremely ornery. I call him Pistol Pete. He just turned 1 in February. He is a great playmate to my little Yorkie. He is wearing the Classic Trench Coat by Dogo. Posted On 03/09/17 by JOSA B from LOGAN, OH Yes, JOSA B recommends this product! This is a great trench coat & so stylish. Easy to get on and off which I find to be very important. I had trouble with the leash holes that was not quite big enough, but I snipped with a pair of scissors to make a little larger. Cured the problem. Highly recommend this coat. My dogs love them. Don't want me to take them off. Posted On 11/21/16 by William S from Astoria, NY Yes, William S recommends this product! 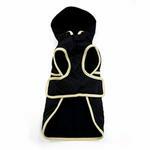 Best thing it is a perfect fit -- and the EASE of which the coat goes on, Slips over the head, with side Velcro flaps. 3 seconds on, 3 seconds off. Posted On 12/11/15 by Margo from , Yes, Margo recommends this product! This raincoat is adorable and functional. After a couple attempts I finally ended up getting the size Large for my 18lb Pekingnese mix in order to fit her barrel chest and longer torso properly. Hood is removeable, which is a nice option.